TODO: Insert Envelope might work if you select the first orientation (Horizontal Left) and make sure the Sender Position from Left is at least .63". Worth a try one day. Printing envelopes in LibreOffice with the HP OfficeJet 4620 is possible, but not by using Insert > Envelope. These are just some rough notes. Email me if you want more specifics. These techniques should apply to all printers. I was using LibreOffice 4.0.2.2 for this. Future versions might provide better support. The first important thing to bear in mind is that Insert > Envelope... is not necessarily the best way to print an envelope. I've found that when Insert > Envelope... doesn't work, Format > Page... does. Basically, use Format > Page to set up a page that is the size of an envelope. On the Page tab, select "#10 Envelope" for a standard US business envelope. There are other settings there for other envelope sizes. Pick whatever is appropriate. Then select "Landscape" orientation. Set all the margins to 0, and click Apply. This will give you a "The margin settings are out of print range." popup. Click "No" and the margins will automatically be adjusted to the limits of the printer driver. For the 4620, you'll find that the left margin will be at .58". Note: For the 5740, I had to manually set the left/right margins to .63". I also set the top/bottom margins to .38" just to make it a little easier to work with. Now, given this properly formatted page, put in your return address and destination address in the proper locations. You are ready to print. Click here to download a sample .odt file with an envelope template that will work properly with the HP 4620. The HP4620 prints envelopes upside down. The reason it does this is because its top margin is rather large at .58". So, by rotating the printing on the envelope, it can use the much smaller bottom margin to get the return address all the way against the left edge of the envelope. The problem is that LibreOffice appears to have no way to rotate the page 180 degrees. So, instead, we have to rotate the envelope 180 degrees and live with a return address that is a bit too far to the right. It's probably possible to put in text boxes in the opposite positions and set them for upside down text (rotate 180). That would solve this problem, but it would be a bit disorienting to work with, I would think. With the hp5740, the margins turned out to be the same (.63"), so there would be no advantage to printing upside down, other than that you wouldn't have to insert the envelopes rotated. If you want to experiment with Insert > Envelope, you'll want to play with the orientation settings for the printer. The first orientation actually seems to work, but is cut off to the left. The fourth orientation setting should be worth trying as I think it might be the best. The fifth orientation setting which looks like it is perfect for the 4620 is actually completely wrong. Although the envelope is fed exactly like this, the printer always centers the printed page horizontally. So orientation 4 should end up in the perfect position. I need to try it. So far, this is the best that I have been able to accomplish with this printer. email me if you need me to expand this, or if you have further suggestions. A "Rotate 180" feature in the Format > Page dialog would be helpful. 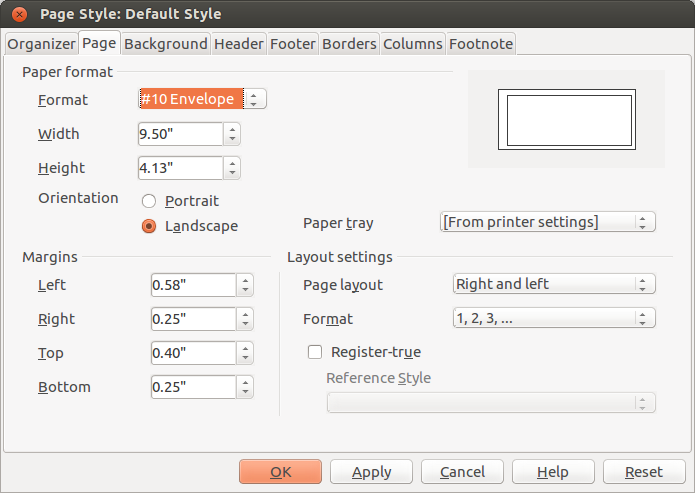 Suggestions for the developers of LibreOffice... A "rotate 180" feature is needed in the Format > Page dialog to allow proper envelope printing on printers like the 4620. This is also needed on the Insert > Envelope dialog (possibly along with numerous other fixes to support this particular printer). Sister Dorothy over at the St. Placid Priory sent along the following two template files for use with the LJ1320. They might be of interest with other printers as well. Format.Page.EnvelopeTemplate.odt - Using the Format Page approach. Insert.Envelope.Template.odt - Using the Insert Envelope approach. Instructions included on page 1. Permission is granted to copy, distribute and/or modify this document under the terms of the GNU Free Documentation License, Version 1.3 or any later version published by the Free Software Foundation; with no Invariant Sections, no Front-Cover Texts, and no Back-Cover Texts. See http://www.gnu.org/licenses/fdl.html for the full text of this license.